Trade Show Momentum Requires PR Messaging - DPR Group, Inc. 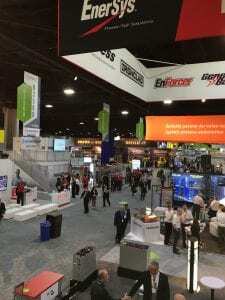 The exhibit floor of MODEX 2018 in Atlanta. MODEX is a staple international event for material handling and logistics equipment and systems manufacturers, integrators, consultants, and third-party logistics providers. There is a definite sense of momentum and expansion throughout all corners of the supply chain space. If I had to choose just three words to descriptively forecast how supply chain decision makers will inform their forward-thinking strategy, I would select: “innovation, growth and precision.” Another descriptor, “messaging” remains an ever-present concern. That’s a composite of all that I heard during my time mixing, mingling and marketing recently at MODEX 2018 in Atlanta. DPR Group had three clients in attendance at MODEX: Cimcorp, Barcoding, Inc. and Westfalia Technologies Inc. While DPR Group Account Executive Edward Lin was in attendance on behalf of Cimcorp, I was at MODEX as DPR Group’s brand ambassador to do what the other record 28,000 attendees where there to do – to see and be seen. Anybody who has ever risen early on the Black Friday after Thanksgiving to holiday shop at a big box retailer amid a sea of humanity would have recognized a similar picture at MODEX. While the ill-tempered pushing and shoving was thankfully absent, record crowds clamored to take in as much of the legion of newest offerings from more than 800 companies across 300,000 square feet of exhibitor space as possible. Alternating every other year with its sister trade event ProMat, MODEX is the premiere international event for material handling and logistics equipment and systems manufacturers, integrators, consultants, and third-party logistics providers. The theme of safety and efficiency was ever-present with a plethora of new product offerings focused on ergonomics to cut down on repetitive stress injuries, as well as “augmented reality” technology that helps companies design and refine custom equipment virtually in a 3D model before construction to get it built right the first time. Companies are clamoring for quality products built not just quickly but to perfection. Time is money after all. As I spoke to company representatives on the exhibit floor trying to determine their pain points, the number one thing they related to me is just how difficult it is to find good writers in the supply chain and logistics space to effectively articulate their company’s message. We understand that consumers want what they want, when and where they want it. We also understand the added pressure this places on manufacturers and retailers to create agile supply chains in order to meet consumer demand. That’s something a lot of agencies just don’t understand. They lack the experience and bandwidth to understand the supply chain and logistics industry as a whole and, therefore, are unable to create a message that speaks to the pain points of current and prospective customers and how your company can help them build a better supply chain. Moreover, too many PR firms have a paint-by-numbers formula that’s inadequate or absent a real strategy. Imagine seeking out a custom tailor only to be made to fit into the same off-the-rack suit that everyone else wears. By contrast, DPR Group has a 20-year track record of devising and executing focused, strategic plans that combine a mix of public relations and marketing tactics to help our supply chain clients attain their business objectives. Trade shows like MODEX and the upcoming ProMat 2019 offer a host of invaluable opportunities for participating companies of all sizes, including meeting potential clients, checking out the competition and gathering innovative inspiration, as well as networking and relationship building. I encountered many companies attending MODEX for the first time. Expect the trade show participation upward trend to continue into the foreseeable future, according to the Center for Exhibition Research (CEIR). Participation in a trade show can represent a significant investment for any company. However, the price of not participating could cost you even more in the long run. It’s never too early to develop a strategic plan to make the most of your company’s trade show participation. If messaging isn’t a big part of that plan, it should be. Partnering with an experienced and trusted PR and marketing agency with two decades of supply chain experience would help develop that message and help make the most of your investment. Liz Palm is Vice President, Marketing & Operations at DPR Group.